By: Diane Kashin, Ed.D, RECE. With the start of another school year, early childhood programs, are once again faced with choices – to theme or not to theme? Themes are like worksheets, they represent a school model. I have written about worksheets in previous posts from both a mathematical lens and a literacy lens. I admitted to using worksheets when I began my career in early childhood education. Now, I admit I used themes. As an eager and ambitious teacher, I was anxious that the theme of the week that I had chosen was represented and visible. The easiest way to do that was the use of pre-cut shapes or as I referred to them, “cut outs”. I can remember sitting in the sleep room and cutting out 30 turkeys for Thanksgiving and how tedious it was to do! Fundamentally this practice was very short sighted on a number of levels. The greatest issue that I now see, in retrospect, is that themes are teacher directed and teacher owned. The trouble with cut outs is that they greatly restrict a child’s creativity and individuality. In absolutely no way, should cut outs be considered art. 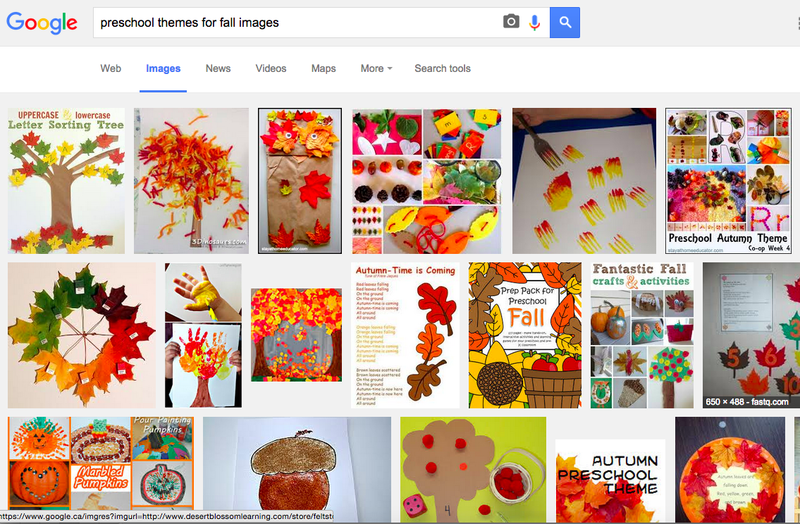 Take a look at these images and decide for yourself about themes and pre-cuts. Thematic units are a way to organize learning around a key concept. The common issues and concerns about using themes involve planning themes in advance and choosing themes with questionable meaningfulness. Often teachers use seasons and holidays as the guide to curriculum planning with themes. Holiday themes run the risk of being little more than a convenient backdrop for classroom decorations and craft displays. When themes are chosen without consideration of children’s interests and development they run the risk of being meaningless. Children need to be involved in the process and there needs to be consideration of how children learn. Since themes are often short lived (one week in duration), there is also potential for a lack of depth. The message being communicated through the use of themes is that there is a great deal of information to be consumed by children through a transmission model of learning. Themes related to the alphabet, numbers and geometric shapes are accepted as important concepts for children. The difference between a theme method and a curriculum with an emerging focus is that that what children actually know about the subject or topic is as relevant as their interest in that content. As Vea Vecchi reminds us we need to leave as much space as possible for children’s original thinking. She reminds us to give greater attention to the processes rather than the final product. The theme approach involves a mimetic focus with the children imitating an adult’s conception and understanding. According to the theory of constructivism, knowledge is acquired through active involvement with content instead of imitation or memorization of it. Theme-based curriculum is inconsistent with a constructivist stance as it ignores the research that suggests that knowledge is actively acquired. Fleet (2002) suggests that the teachers of young children are often distracted by their obligations to follow the theme of the week and the strict timetable that corresponds with the implementation of a theme-based curriculum. Time frames and transitions that accompany the day and the theme often ignore the possibilities of challenge and active engagement. Taking the colour red as an example of a narrow theme, Fleet (2002) asks, “Why focus on a primary colour and does it matter?” (p. 21). When themes are tightly scripted and dependent on teacher direction they provide a predictable sequence for the teacher. However, children’s curricular needs are not so clear cut or predictable. The fundamental difference between an inquiry stance or emergent curriculum and themes rests within the image of the child. The young child, when seen as an empty vessel or tabula rasa is viewed as needing to reproduce pre-determined knowledge. When adults and children engage together, the child is seen as a citizen and co-constructor of knowledge. Early childhood educators inspired by the Reggio Emilia Approach see the child as having surprising and extraordinary strengths and capabilities in their co-constructing role rather than a reproducer of the teacher’s knowledge. Themes may involve patronizing practices that assume the child is without his or her own theories. Themes may be used in a misguided attempt to address academic achievement. Concepts involving colour, numbers, geometric shapes, and letters support children’s numeracy and literacy development. If however, numeracy and literacy are restricted to a week-long theme, these important concepts may not reach the depths of meaningful learning necessary to be retained. Children are not passive learners. The use of academic themes such as the alphabet, numbers, and shapes accepts a view of the teacher as the purveyor of knowledge and the learner as the receiver. This view of a passive learner does not correspond with the theories of Dewey, Piaget, or Vygotsky. It does however, have wide support. The increasing demand and widening expectation that preschool and kindergarten programs ensure children’s readiness for the next grade may account for the increasing pressure to introduce children to academic themes very early in life. I understand why themes are hard to give up but I am making my line in the sand and suggesting that if themes involve using pre-cuts or cut outs than the practice should be eliminated. I am very curious whether the practice of themes is ever done without the use of cut outs. Pre-cuts are not art. As an early childhood education student in 1980s I first heard of “process versus product” as it related to art experiences for children. What I didn’t know then, was that process art is an artistic movement as well as a creative sentiment. For more on children’s process art check out http://fun-a-day.com/process-art-for-kids/ and for more on the differences between process and product I recommend http://rainbowswithinreach.blogspot.ca/2014/11/childrens-authentic-art-vs-classroom.html. Lisa Murphy, has a helpful handout that can be found here. There has been much written about child-centred art versus teacher directed projects. Process art does seem to be gaining more and more attention. However, process art is not without it’s problems. 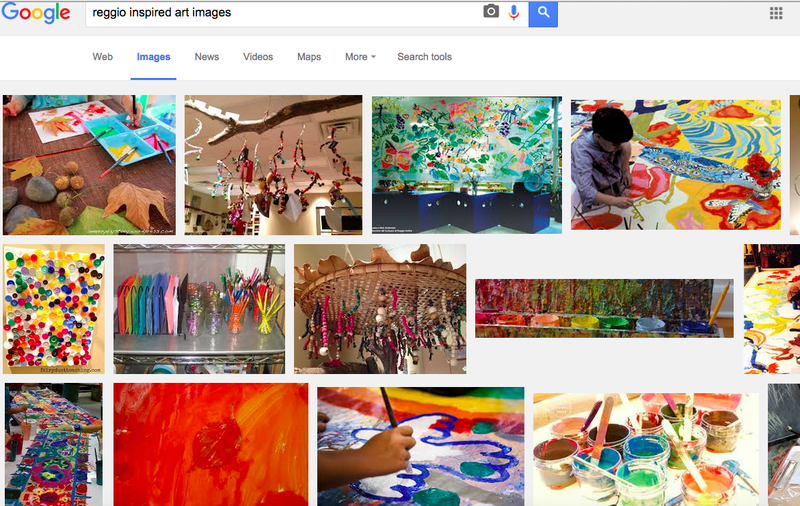 I have found the use of Google images to be helpful in my reflections on art and process. 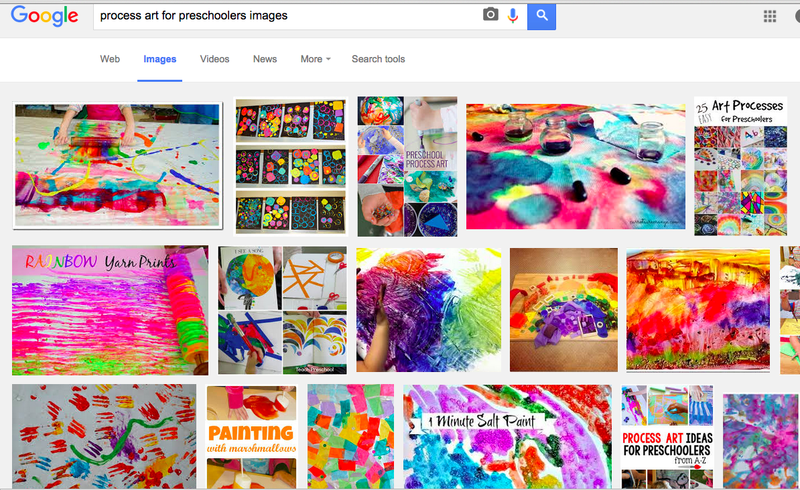 When I “googled” process art for preschoolers this is what I found. As I scrolled through the images I could see that for some, process art involves the use of food – marshmallows, celery, corn cobs, etc. I realize that bringing up this issue means I am wading into sensitive territory. The use of food in art requires the stance of reflection and careful consideration. In everything we do, as early childhood educators, ethical decisions are required. Sometimes, we need to draw our line in the sand. I have seen long and heated discussions on Facebook about food and art. I read that some use food that is “dated” like expired pasta or food headed for the composter, like carrot heads. I read other posts that question the use because of the messages it sends about wasting and disrespecting food. Again, I do admit that I used food in art when I was working with children. It is not something I would do again nor would I ever use pre-cuts again. I will not accept these practices from the early childhood education students that I see in placement nor will I accept worksheets. I see myself as ever evolving on this journey of Reggio inspired practice. Just because I used worksheets, cut outs and food in my practice, does not mean that I cannot change. I am not condemned to live forever in this limited view of the child and myself. I see myself as capable, competent and rich in potential. I see other early years professionals in the same light. Let’s take a stand together, to draw that line in the sand. If the theme is general, in terms of something all, or at least most, children are interested in such as ‘transportation’ or ‘ocean creatures’, & the theme is explored over a long period of time, at least 3-4 weeks, I think the Reggio Emilia Approach can be embraced. I agree, “no precuts” – children need to have the freedom to be creative (& competent – always). Themes provide a way to organize books to read & nuersery rhymes to introduce at certain times of the year. Eg: Pete the Cat, I Love My White Shoes – perfect for beginning the year, theme titled “Special Me”, to introduce resilience “Did Pete cry? Goodness no” has become part of the lexicon in my class of 3 year olds. If the activities we choose to offer to our children are open-ended, creativity will ensue. I like the idea of looking for the “verb” rather than the “noun” when exploring an inquiry (theme). Thanks Diane. Good food for thought. When i was working in kindergarten classrooms as a DECE we tried to program by the children’s interest. Our planning sheet would start out blank and we would see what the children were doing. As i would recognize an interest or “wonder” i asked the kids what they wanted to know then engaged them in our “research ” by taking them to the library to look for books or online. We may start with a general topic like transportation initially but as Diane says, we then would narrow it down to one specific type of transportation like steam trains.. then when they felt they knew what they wanted to know we moved on to electric trains. Then magnets because we read how some trains are held on the tracks with nagnets. I’ve done a month long inquiry on paper planes figuring out what paper/design flies better? They leant about math, science, language, reading, writing, social skills. .. because they were engaged, interested and motivated. Excellent piece!! I always enjoy your articles!! Such a great way to look at “themes” if you must…”look for the verb rather than the noun”. I really enjoyed this article on a topic that needs to be addressed! Seeing themes already in my first 10 days at our school. Ugg! Thanks Karen – I think I will need to write a follow up blog post. Thank you for this beautiful but to the point post. It’s a great explanation of the shift away from themes. Often educators know they shouldn’t be using the see but struggle with explaining the why behind it. Thank you for compiling the information into an easy to read post. Thank you Angie … I really appreciate all the kind feedback. Thanks for this post Diane – I think one would be hard pressed to find a seasoned early years educator that has not fallen into the traps of themes and worksheets in the beginning stages. My undergrad ECE program did not have us look deeply at curriculum, but rather it was something to simply accept when working at a school. I did not have any ideas besides themes when I began, so themes it was. 11 years in, I reflect on most every decision I make with children. We have to ask ourselves, why are we making this choice for children? How does it help us connect more deeply? As a teacher, I hope that I can support children in deep, engaging learning experiences that they steer. Thank you Allie. I too, did not have an alternative to themes when I began teaching but we have alternatives now. I am going to keep addressing this important topic. I think your question of asking “why are we making this choice for children”? nails it! School ‘s starting on Monday here in Greece and I am totally puzzled, about how to proceed this year. You see I never hand out cut outs or photocopied worksheets and I am always trying to hand out open- ended materials. But themes really help me out at least until January. For example when Autumn really settles in, we are taking nature walks (we are blessed with a huge garden) with our magnifying glasses and we discuss, we make art with leaves etc (I provide the supplies and they use it however they want), we read books, we watch our turtles and the birds and the weather and…. We do that in the Winter and in Spring and of course whenever the kid feel like it. Sometimes other themes emerge and we take advantage of them (as a project approach), but sometimes they don ‘t. 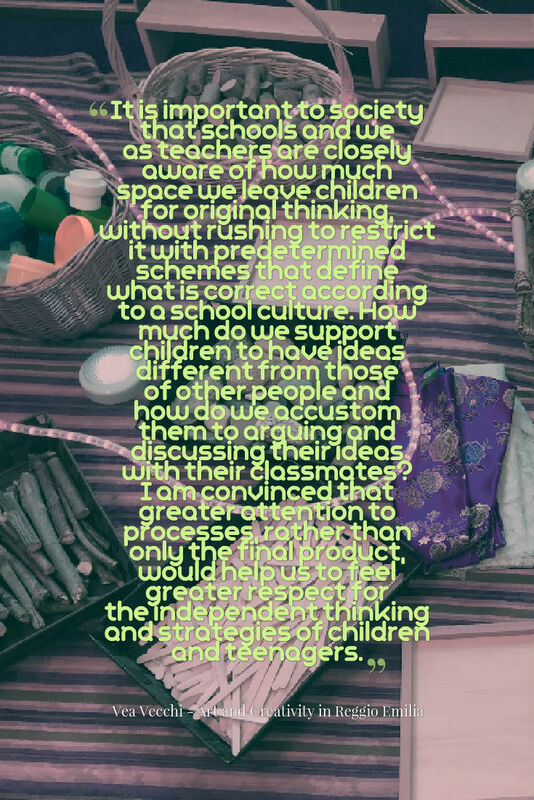 So we may not be “Reggio” enough, but what I am trying to say is that it may not be the theme itself that shortens our perspectve, but our perspective and the way we “use” the theme may narrow down the thing children can do and learn. So I guess a sound approach could incorporate themes and free-er (duh) ways of learning. Thanks Rita – if you are puzzled that is good – it means you are in a state of disequilibrium which leads to learning and growth. I don’t know anyone outside of Reggio Emilia, Italy that is “Reggio” enough so this shouldn’t be a concern to you. If you are reflecting and considering children’s perspectives, voices and images then you are on the journey to authentic practice. I do believe in teacher/student directed activities, and I do introduce a theme for the month, but if the students don’t seem interested I incorporate their ideas into the theme also. I love the lens of schema play, Cindy! We must write a blog post about it together! Thanks for your comment and feedback. Great article! so many points I’ve talked about over the years with my early childhood pre-service teachers. And I too, can admit to using some of the things that I quit using. But it is useful to think about why we gave those things up so we can help others think along those lines now instead of later. One thing that I have thought about is the rule about using food. We talk about this quite a bit in university classes because I want my students to be critical consumers of knowledge. But to just say that food is not appropriate for art kind of misses some ideas that professional artists are conveying with their use of food as a medium. So, like any “rule”, there will be exceptions to those rules. For example, I show an image from the internet of an obviously teacher guided “art” activity of cereal glued to construction paper to make a rainbow. That prompts lots of comments and questions. But then I show art images from the internet showing intricately created mosaics created with cereal and that is another conversation about food as media and where the line might be between wanting to convey cultural concerns about using food and the artist. Not that I want them to use food as an art medium with children, but they also need to appreciate art as something that makes us think about the world. I agree Sara that the topic of the use of food is one that can be used to illicit discussion and that there are multiple perspectives. Thanks so much for your comment. We actually were encouraged to teach in themes, when I was a new teacher. So funny how things change. So glad that we continue to evolve as educators. In reflection I wonder how much patterns and product art has taught children about conformity and acceptance? Projects that look like, the teachers “good”, those diffrent “bad”. Does that then perpetuate the idea that those diffrent from us, are bad? That appearing like everyone else is the desired outcome? Scary when you consider these are the building blocks of all the isms (racism, sexism, etc) or even just bullying. Everything we do as educators sends a message, it maybe the one we Intend or not. On a personal note, I was just discussing with my daughters early childhood teacher something I witnessed as a student teacher. I was working with the director of a chic private Christian Preschool teaching a 2 year old preschool class. We made pumpkins with precut faces the children pasted on. I caught her peeling the eyes and mouths etc off childrens pumpkins in front of them and resticking them in “proper” place. So pretty much, she made the entire project herself. Lol She is also the one who demonstrated how the children were allowed to play with each toy, before free play. Lol Student teaching can be as much about teaching us what to do as what to do. I have seen this too! I have watched teachers fix up the pre-cuts so they look a certain way – “proper” like you describe. If we didn’t use cut outs then this would not be an issue! Excellent articles and replies! Reminded me of “Core Knowledge”. This inappropriate prepackaged program outlines thematic units and is adopted in many states. For example, in kindergarten one of the first mandated “themes” is the Antarctic. Why would ANY early childhood educator agree to teach about this in the month of August when it’s blazing hot outside is beyond me. At a time when butterflies are heading south, fruits and vegetables are ripening and so many other things that capture children’s attention would you focus on such a faraway place that is in a perpetual state of winter? Teachers must embrace their role as early childhood leaders and advocate for best practices in the interest of young children. We need to borrow from this articulate article and express to the “decision makers” what we know to be true about how “themes” should come from the children and how intuitive, skillful teachers can facilitate their learning language arts, math, science and social studies when using the children’s interests as the vehicle that drives the curriculum. I agree and we should believe in ourselves to create our own ethical practice based on our own context and professional knowledge. Thanks so much for your comment and feedback. You had me 100% (I struggle this time of year when I enter ECE facilities decked out in apples and leaves and am forced to think about the valuable time that was wasted in cut-outs that could have been used in deep reflective practice) but then you mentioned the food thing! I just can’t understand this perspective. When I make playdough (with food items) or put cornmeal in the sensory table how is this any less “wasteful” than offering unlimited amounts of paint to explore or, for that matter, even offering the copious amounts of paper that children require to fully explore that paint? In fact one could argue that the store-bought playdough with all of it’s packaging is actually more detrimental to our communities. I just cannot believe that I am “disrespecting food” if I am offering the children a valuable play experience. Could you please offer me some additional reasoning for this perspective so that I might become better informed? Thanks for yet another powerful post. Thank you once again for an excellent discussion. I have just shared it on the Full Day Kindergarten, Early Years Teaching in Ontario FB page. As I mentioned when I posted it, often FDK educators are told to stop using theme based teaching but are not given sufficient rationale – comes to them as a “dictum” without the foundation. Thanks Betsy and thanks for posting on the Facebook page. It has been amazing to keep track of all the shares and comments made about this post on Facebook. Not everyone is in agreement and some have felt that I was being judgemental which was not my intent. On the most part the feedback has been overwhelmingly positive. I am thrilled that it has created lots of dialogue and hopefully, some will reflect and reconsider. I imagine all the shares and likes regarding this post is a reflection of a great need in the field or early education. The dialogue will most likely be quite variable between educators as you are asking for a change. We often resist the most what we need the most! I agree with you about putting out invitations for children to explore over time, which builds endless creative possibilities. Thank you for following my blog. I stand in awe of your valuable reflections of inspired educating practice. I was thrilled to find your blog; Reggio Mornings – because I work with adults and not children, it is through you and others like you, that I learn so much. You are inspiring to me! Another early years journey into the process of not accepting worksheets and pre-cuts . . . rather an inspiring of creative thinking. Great article Diane. I speak of this quite regularly with the ECE students I teach and with the ECE’s I come in contact with. In my experience the practice of using cut-outs is decreasing….but too slowly in my opinion. Readings this like, and sharing with friends, colleagues and staff is one way to definitely help. Thanks Janet. I agree, that the practice of using pre-cuts is declining – let’s hope that it continues to decrease along with the practice of worksheets and themes! I have also given up cut outs or templates. My themes are much wider now, Last year it was “Journeys” which took us many places and into rich literature and personal pathways. Bigger the see move away from cutouts and give a starting point.This year we start with Our Places Our Faces then we will se where it goes.So yes themes are possible without cut outs it is the process that makes the difference for them and for us. Thank you for your words. I am a parent educator in a large public school in the US searching for support in what I know to be true learning for children. Found it in your words and downloads. Thank you.